Businesses who will be collecting value-added tax (VAT) can register online and subsequently file returns on a regular basis using the government’s e-services, according to the latest advisory. The UAE Ministry of Finance has updated its website to advise companies that VAT registration will open to qualified companies three months before the roll-out, which is initially slated on January 1, 2018. “Businesses will be able to register online using eServices,” the ministry said on its website. According to KPMG, the latest advisory is a clear indication that the UAE government remains on track to launch VAT less than a year from now. "Based on our international experience with the VAT implementation in Malaysia, the time for businesses to prepare is tight. While some of you will have started preliminary preparations, having established a budget and project teams, action needs to be stepped up," KPMG advised businesses. Companies, however, will need to meet the requirements prior to signing up. Registered businesses will then be required to submit quarterly VAT returns online. “It is expected that the default period for filing VAT returns will be three months for the majority of businesses,” the ministry said. The Gulf Cooperation Council (GCC) member states had earlier agreed to collect a 5 percent VAT from January 1, 2018, as a way to raise non-oil revenues. Details as to which goods and services will be covered have yet to be announced, with the UAE VAT law still being finalized. Businesses are advised to await the official announcement and regularly check the Ministry of Finance website for updates. However, there have been questions about the readiness of Gulf businesses in the implementation of VAT. Rakesh Pardasani, partner at RSM, noted that due to low taxation in the UAE, a lot of firms don't have proper accounting and record-keeping infrastructure. “Lack of taxes has created a culture of non-existent or at times where it exists, haphazard record keeping and accounting. 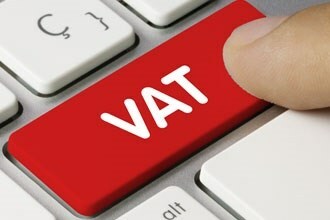 And when it comes to VAT, proper accounting is the backbone for proper compliance,” Pardasani told Gulf News. He noted, though, that there has been an increasing number of companies seeking professional guidance on how to prepare for VAT, especially since the roll-out is only less than a year away. “The days of managing businesses without any accounting records are numbered.The introduction of VAT will put the onus on businesses to ensure that they keep proper records and are assessed as to the VAT liability based on those accounting records,” said Pardasani.